This purse is in good condition for it's age, just minor signs of wear around the edges. I'm not sure if it's real snake, but sure looks it. I say this because the lining looks like fake leather. There are a few cracks in the folds that I over looked. The inside zipper compartment doesn't look used at all. Snap closure works fine too. 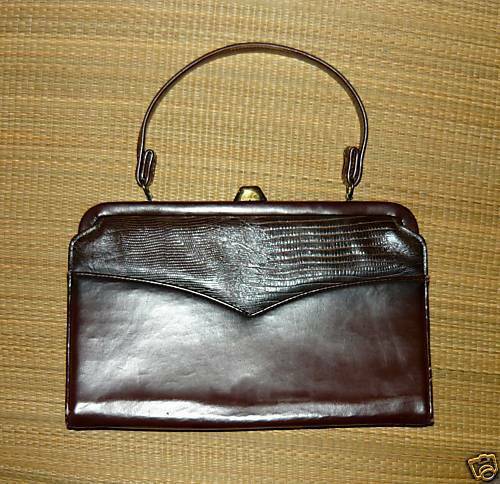 All in all a good buy for this classic purse. Bag is 11 1/2"x7". Perfect if your a fan of Mad Men. I will be selling off various mixed merchandise from my closed consignment shop. All is in excellent condition unless stated otherwise. I describe items to the best of my ability, so please consider complete listing and MEASUREMENTS to save conflict later. We both want a fair and pleasant transaction now and in the future. Please ask if there is any confusion about the listing and I will do my best to answer in a timely manner. Here's hoping for a long and pleasant relationship with you. I want to become your little shop down the block. Drop by and find something cute for yourself. I'll put the tea pot on. Sincerely, Lulu Please enjoy your shopping experience.